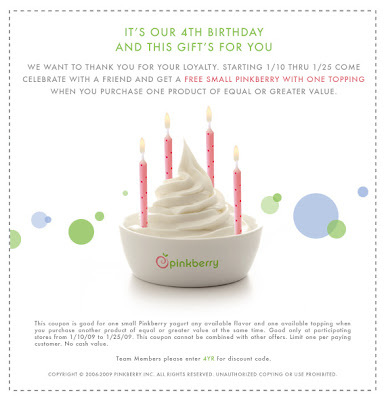 Apparently I got this today in my email from Pinkberry (Yes, I do like Pinkberry and I subscribed to their newsletter). To celebrate their 4 year anniversary, Pinkberry is offering a free small yogurt with one topping if you buy one yogurt with the same or greater value. The coupon is good from Jan. 10 to Jan. 25. Thanks for the coupon, PepsiMonster. I love pinkberry. Hi! Came to your blog from MyCollegeKitchen's when I saw the snippet on the Pinkberry coupon. I'm gonna go this week because it's be in the 80's here! Thanks so much. You are all very welcome! Hope you all can take advantage of this coupon real soon before it expires.